Startpage > Good to know > Comfort zone, what is it ? Comfort zone, what is it ? It is very important to choose wedding rings correctly. After all it for the rest of life. What you need to know when choosing wedding rings? If your fingers shape is A – fingers straight. Joints and phalanges of the same size. Excellent form. For you will suit rings of all forms. If your fingers shape is B – conically shaped fingers. Joint narrower than phalange. For you will suit rings with comfort zone: A, B, C, D, F, H.
If your fingers shape is C – form of hourglasses, then joint wider than phalange. 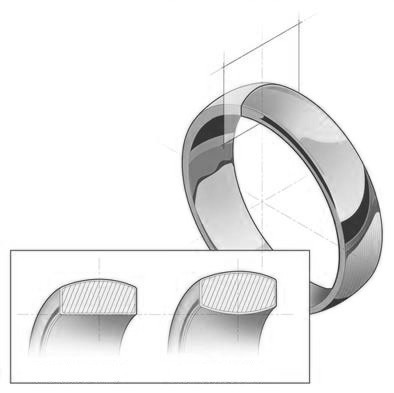 For you will suit rings without comfort zone: E, G.
And what width of a ring?. . .
We share several photos of the made rings in which is visible the inside of a ring and colour. The ring can be not only from red gold, and you can imagine and choose a colour, which is pleasant to you most of all: white, red and yellow, if you wish it can be even black colour! Of course, before decision-making, what rings to choose, we suggest consulting with jewellers. They are professionals, because of that they really sincere advise what will suit you most of all and together make the best decision to which you will be glad all life.